One of my favorite political scientists, Deborah Stone, wrote that much of the policy process involves debates about values masquerading as debates about numbers and facts.1 Although her construct is abundantly in evidence, it is being overlooked in the current debate over the future of the Affordable Care Act. How much are premiums rising? How many plans are operating in the exchanges? How much money are accountable care organizations saving? What impact would a per capita cap financing scheme have on Medicaid? How much has the ACA restrained or propelled health cost growth? What do opinion polls show? Each side furiously hurls data and anecdotes at each other as if by identifying the killer data point, the other side would throw up its hands in surrender and declare: “How could we have been so dumb?” Of course, this never happens in public policy debates. It never happens because numbers and anecdotes don’t motivate people on an issue as charged as the ACA. Values do. Consider values without the emotional jolt. I prefer walking to work rather than driving. My wife, with distance and options approximating mine, values driving. It’s not about right or wrong (she has lots of stuff to lug). It’s understanding what motivates each of us to our preferred choice. We can and do judge other’s choices, though when it comes to the ACA, let’s not do this for a moment. What are the core value differences between Republicans and Democrats about the ACA? Most important is whether the ability to obtain medically necessary care should be treated as a human right. Americans have long-standing disagreements over this question. Starting with Germany, every other advanced nation has embraced medical care as a right over the past 130 years, most since 1950. The United States, with libertarian roots reaching back to colonial times, has not. Whether or not Americans have an obligation to each other to provide necessary medical care is a central value disagreement about the ACA. Most Democrats embrace the human rights claim, although they may disagree on the nature of the right (eg, whether to secure it through public or private means). While this disagreement often gets nasty, especially about single-payer financing, Democrats demonstrate broad agreement on the duty of government to actualize this right. Before the ACA legislative process began in 2009, many Republicans seemed to agree, demurring that the right should be built on an individual mandate and private insurance. While some, such as the late senator John Chafee (R-RI) meant it, we know now that this was not a serious claim by most. Today it is hard to find a Republican public official who publicly accepts medical care as a human right. Governor John Kasich (R-OH), who has withstood withering criticism from his party for implementing the ACA’s Medicaid expansion, stands out, though I have no idea if he regards medical care as a human right. We all value many different things, many of which can conflict with each other. Many people, for example, value both health care and lower taxes, with no sense of contradiction. Yet we only appreciate which values really matter to us when they conflict with each other, and we must choose one or the other. Health care versus taxes is a key conflict in the ACA and critical to understanding value differences between Democrats and Republicans regarding the right to medical care. Even though most Americans don’t know it or don’t believe it, the ACA was fully financed through a combination of reduced Medicare payments to medical care providers and higher taxes on pharmaceutical, medical device, and insurance companies, and wealthy households. How big a deal is this in the ACA debate? It doesn’t get much bigger. In this century, the federal government has enacted 3 major health reform laws: (1) the 2003 Medicare Modernization Act (MMA) that created the Medicare “Part D” outpatient prescription drug benefit; (2) the 2010 Affordable Care Act (ACA); and (3) the 2015 Medicare and CHIP Reauthorization Act (MACRA), which reformed payments to Medicare physicians. Both MMA and MACRA were written and approved by a Republican-controlled Senate and House. Both laws cost substantial money, although not nearly as much as the ACA. Rather than pay for these laws through payment cuts or higher taxes, Republicans chose to finance the lion’s share by adding the cost to the national debt. 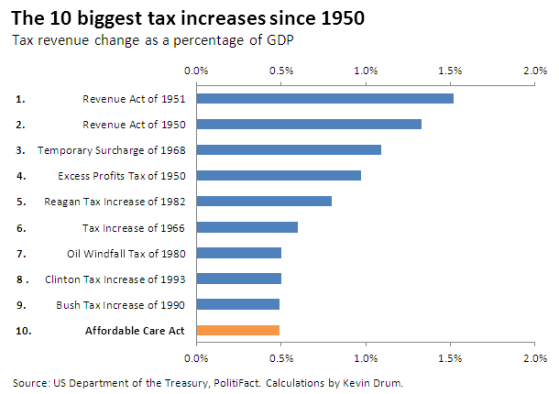 In this century, Republicans have not passed a significant health law without increasing the federal budget deficit, and they refused to vote for the ACA, which was financed in large part with higher taxes while slightly reducing the federal debt. The right to medical care is at the heart of the ACA partisan divide and turns on each side’s value preference for health care versus taxes. Democrats are willing to raise taxes to expand medical care to everyone. Republicans will not vote for any health care legislation reliant on higher taxes. If politically feasible, they will raise the debt to pay for health care priorities, but if new taxes are required, then the answer is firmly no. Colleagues from outside the United States often express confusion over the notion of taxes as a value, as they view taxes as an instrument or tool, not a value. In the United States, especially since President Reagan’s era, opposition to higher taxes and a commitment to lowering taxes have become core Republican values. More than anything, this explains Republicans’ deeply held and enduring antipathy toward the ACA. Other features of the law also explain their opposition, including the expanded powers of the federal government. But none explains their hyperopposition as much as the ACA’s new taxes. Ironically, the closest model for the ACA’s Health Insurance Exchanges is the Medicare Part D drug benefit, created by a Republican president and Congress in 2003 through the MMA. Under the MMA, private insurers make drugs available to Medicare enrollees through federally regulated private plans, using federal subsidies to reduce prices. Sounds like the ACA. Indeed, until the summer of 2009 when Tea Party mobilization scared him away, Senator Charles Grassley (R-IA) was the essential partner of Senate Finance chair Max Baucus (D-MT) in designing the ACA, using Part D—which they created together in 2003—as their principal model. What is the big difference between the Part D drug program and the ACA’s insurance expansion? The latter is funded by new taxes. To understand the difference between Democrats and Republicans regarding medical care as a right generally and the ACA specifically, the place that matters is where health policy and tax policy converge. Stone D. Policy Paradox: The Art of Political Decision Making. New York, NY: Norton; 2011. Politico and the Harvard TH Chan School of Public Health. The 2016 Election: Clinton vs. Trump Voters on American Health Care. October 2016. http://www.politico.com/f/?id=00000158-039b-d881-adda-77db04b70000. Accessed March 9, 2017. This is a variation of the 1992 political slogan coined by political consultant James Carville: “It’s the economy, stupid.” https://en.wikipedia.org/wiki/It’s_the_economy,_stupid. Accessed March 9, 2017.